This is good mixed with champagne, and mulberries left over in the jar make a good base for a tart or pie. 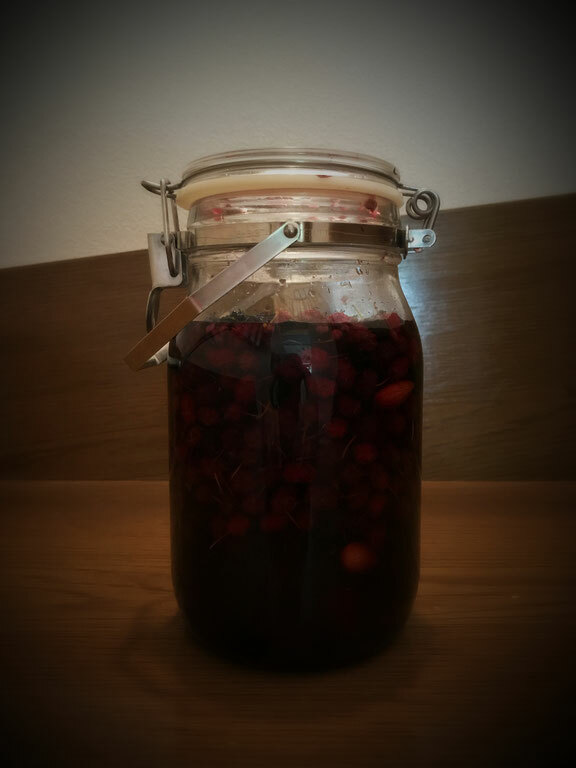 Make it as you would sloe or damson gin. Put the fruit into a large sterilised jar with the vodka or gin and the sugar. Add the roasted almond - a wonderful addition to the taste. Close the jar tightly and put in a dark place for two to three months, turning it as often as you remember - ideally every few days - until the sugar has completely dissolved. Then strain off the mulberries and almonds. Taste the liqueur and check that it is sweet enough. I prefer it to be not too sweet, so I add a comparatively small quantity of sugar. You can always add more at the tasting stage. When adding more sugar, turn the jar regularly until it dissolves. Pour the liqueur through a funnel into a dry, warm sterilised bottle and seal. The discarded fruit is absolutely delicious when eaten on top of ice-cream or yogurt, or used as a filling for a tart or a pie. Copyright © 2011-2015 mukorossi organic hair atelier All Rights Reserved.